Texas community college students gathered Jan. 30 at the Texas Capitol to meet their representatives and participate in the governmental process. A bus of TCC student leaders and faculty representing all six campuses left in the early hours of the morning for Community College Day. The day started with schools gathering for group photos on the steps of the Capitol followed by a rally. Bill Greenhill, TCC board of trustees member and Community College Association of Texas Trustees chairman of the board, was one of the speakers to explain the importance of the day to the crowd. “One of the most important objectives we have is to advocate for community colleges, and that means advocate for you,” Greenhill said. Students, faculty and other representatives of community college had meetings scheduled throughout the day to meet with their representatives. House District 101 Rep. Chris Turner met with TCC students before addressing the rally crowd on what to keep in mind when they had a chance speak to their representatives. 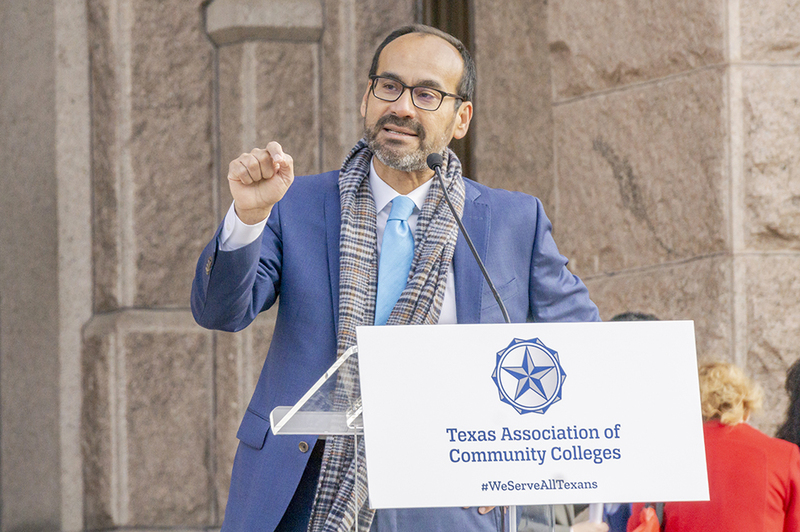 “We need to hear from you to understand why your school is so important, the difference it’s made for you, and why it’s important that the state of Texas provide the support for our community colleges that your schools need to be successful,” Turner said. After the rally, attendees worked their way into the Capitol where they could meet with representatives and sit in the House or Senate galleries during sessions. While the meeting was somewhat formal, Thompson said it was far less formal than he expected. TR student and Power of the Peer orientation leader John Inthachack was scheduled to meet with House District 91 Rep. Stephanie Klick, but spoke to Klick’s chief of staff, Bryan Shufelt, while Klick and other representatives were in a House session. Inthachack said even though he couldn’t speak directly to the representative he felt he was really being listened to by Shufelt. Inthachack was eventually able to meet with Klick briefly as she returned from the House session. South student Angelica Melendez met with House District 95 Rep. Nicole Collier during the day. Melendez said she spent her time with the representative to see what issues were important to Collier. “Not many people get to say that they actually sat down with the person that represents them and discussed their thoughts, their opinions,” Melendez said. Community college students are the next generation that’s going into the workforce and politics, she said. NW student and SGA vice president Julia Antio said she was skeptical of the whole experience prior to making the trip to Austin. “Being honest, I didn’t know who my legislator was, who was representing me,” Antio said. During the day, she said that changed and met with House District 98 Rep. Giovanni Capriglione and discussed workforce skills as well as counseling and advising for community college students. 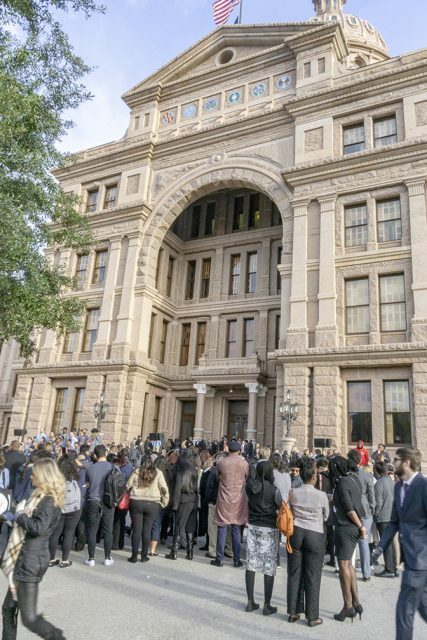 Community College Day takes the information taught in a Texas government class and makes the experience more hands-on, said Tatyana Kisin, South government associate professor and SGA adviser. The day takes place every two years and coincides with convening of each new legislative session, which is currently the 86th session. Somiari Tobin, SE student and Historical Underground president, had the chance to meet two representatives during the trip. Tobin said he discussed topics with the representatives ranging from credits transferring to the Deferred Action for Childhood Arrivals program because he has friends who are Dreamers and unsure of the fate of the program and immigration law. The representatives were also willing to listen to him even they didn’t align with his views on a topic, Tobin said. “Even if the person’s viewpoint diametrically opposed ours, it was addressed,” he said. It’s important to talk about the issues when there is a disagreement instead of avoiding it, he said.